In a strange week of NFL football, multiple high profile teams lost in significant upsets. During the process a few teams suffered major injuries to star players, including a few prior to game action. With that said, here is everything to know regarding the NFL's major injuries. After injuring his toe in Week 8, timetables for A.J. Green's recovery have ranged from two weeks to season ending. The latest report from Adam Schefter pegs Green for a December return. This is longer than the two-week prognosis from last week. 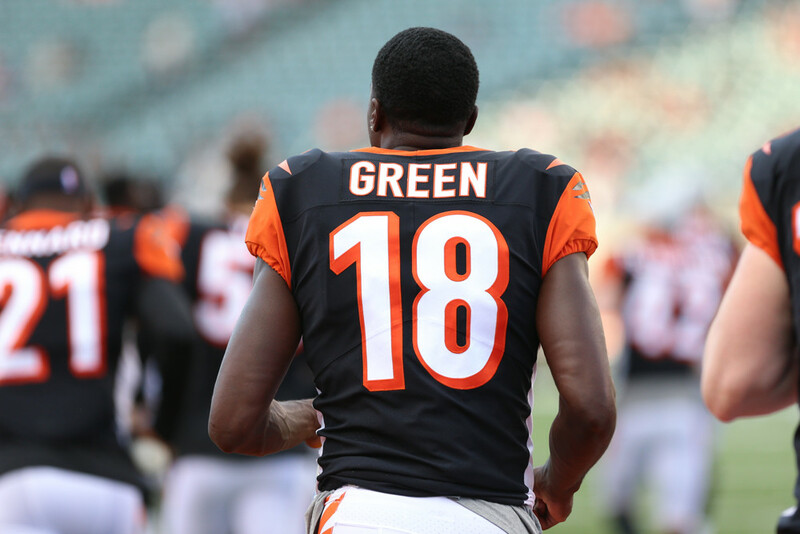 Either way, Green continues to deal with a severe toe injury and should be considered week-to-week. Rob Gronkowski has been dealing with a back ailment for the better part of this season, causing him to miss the last two games. The Patriots reportedly wanted to hold Gronkowski out through their Week 11 bye to insure a full recovery before the team's final stretch of the season. This tentatively puts Gronk on track to play in Week 12, but practice reports should be monitored leading up to the game. Fighting through a hip injury for the better part of the season, Chris Carson could not get the green light for Sunday's game. Carson failed to practice last week, but the Seahawks waited till pre game warm-ups to rule him out. Carson should have a better shot to suit up this week, but practice time will remain important. Recently recovered from a sprained MCL, Cooper Kupp tore his ACL late in Sunday's game and will miss the remainder of the season. Kupp should be ready sometime near the start of the 2019. The Rams will move forward with Josh Reynolds in three receiver sets. After sitting out to this point in the season, Dez Bryant tore his Achilles in his first practice with the Saints. Bryant expects to make a recovery in eight months, tentatively putting him on track for next season. However, already 30 years old, Bryant isn't a lock to play football again. After the Packers placed Geronimo Allison on injured reserve late last week, Randall Cobb also ended up missing Week 10 after suffering a setback to his hamstring late in the week. Cobb practiced on a limited basis last week, but he won't make the trip to Seattle for Thursday Night Football. This means Cobb will miss his second-straight game and remain week-to-week. Dealing with an injured foot, Sammy Watkins narrowly missed suiting up for the Chiefs' draw against the Cardinals. The Chiefs play on Monday night against this week, giving him an extra day to heal. Watkins returned to limited practice on Friday last week and will need to continue that trend in order to play this week. Both suffering injuries in Sunday's game against Green Bay, DeVante Parker has an A/C joint sprain and Jakeem Grant aggravated an Achilles problem. Parker is reportedly week-to-week and while Grant's status remains unclear. Grant avoided serious injury according to Ian Rapoport, but could still miss time. It looks like the Dolphins could be without both receivers when the team returns from their Week 11 bye. Landing a knee injury late in Sunday's game, an MRI revealed a mere bone bruise for Marvin Jones. Jones should be considered questionable for the time being, but he was unable to return to Sunday's game. His status could come down to a game time decision. After popping up with a hip injury during the Ravens' bye, coach John Harbaugh would not name Joe Flacco the starter on Monday. However, he said he hoped Flacco would be healthy enough to start. Flacco was on crutches during the bye and looks legitimately questionable to suit up this week. We should learn more as practice reports become available.